Preface: This piece is sort of a review, but not really. It’s mostly a discussion of what the game did that I thought was novel and interesting, and why I think its unusual elements were so effective. While I do have some criticisms, I don’t discuss them much here. If you’re comfortable with the themes in the game and curious about it, then I highly recommend you experience it for yourself. From here on, there will be heavy spoilers. The game opens with protagonist Senua, a Pictish woman from the Orkney Islands, rowing a boat into the mouth of a river. A calm female voice is narrating her purpose: to journey to the land of the dead and retrieve the soul of her dead lover, Dillion. Prior to the events of the game, Senua has been mistreated and misunderstood because of her neurodivergence, driving her to leave her community in self-imposed exile. On her quest into the wilds to “face her darkness,” she meets a man named Druth, who has escaped capture from the northmen (the vikings). From him she learns stories of the northmen, their gods, and their beliefs about the dead and the afterlife. Upon her return, she finds her community and her love, Dillion, murdered by a vicious viking attack. Thus begins her journey to the home of the northmen to reclaim Dillion’s soul from the land of the dead. Throughout the game, various auditory and visual hallucinations reveal details of her past; an abusive father who thought he could “fix” her mental illness with druidic rituals, a loving mother who experienced similar psychotic symptoms. An uncaring and, at times, openly hostile community who was quick to blame Senua for their misfortunes. And Dillion, a kind, caring man and a ray of light in Senua’s struggle. Senua’s journey comes to a head when she faces the giantess Hela, where she recalls truths about her past and sheds some of her most self-destructive delusions: delusions of guilt for the suffering of her loved ones, and the belief that she could bring Dillion back from the dead. Hellblade plays a lot with perspective, especially during some of its most significant narrative beats. As the player, you hear the voices Senua hears: whispers all around you, encouraging, discouraging, goading, shaming, blaming. However, cutscenes often place the player directly in front of Senua, giving you an up-close view of her facial expressions and gestures, often implying that you (the player) are assuming the role of one of her hallucinations. At first, I was a bit puzzled by the use of third person perspective in a game that’s so focused on getting players into the character’s head. But as the game progresses, it solidifies this idea that the perspective we see as the player is a piece of Senua’s mental ecosystem, a manifestation of her hallucinations. Not only do we see and hear all the hallucinations she does, but we also find ourselves looking through them back at her. The narrative punch of this perspective play is only possible thanks to an incredible performance by Melina Juergens, Senua’s voice and mocap actor, who just won an award for said performance. The story framing around Senua’s psychosis becomes an effective narrative justification for the use of “in media res” storytelling, providing a refreshing variation on tired amnesia tropes. Players learn Senua’s story as she comes to grip with reality and tries to separate her trauma and illusions from her actual past. Hellblade also utilizes the video game medium by presenting surreal and supernatural elements (encounters with norse gods, finding runes and symbols throughout the environment) with the pretense of doubt. Are Senua’s experiences with the fantastical simply a video-game version of reality, or are they delusions woven from the threads of her past? These questions emerge gradually throughout the game as the player gains more context and backstory. The gameplay variation in Hellblade is probably one its most divisive aspects. While the combat system is satisfying, and provides some interesting options to experiment with, you’ll only really spend a few hours in combat over the span of an 8ish hour playthrough. The combat serves as one of many elements of Senua’s struggle. A hefty portion of the game is puzzle-solving, often in the form of looking at the scenery from different angles in order to see paths forward or find runes needed to unlock doors. This mechanic leans heavily on the game’s visuals, asking players to spend time exploring and investigating the world in detail. Thanks to strong art direction and visual effects, the perspective puzzles are generally engaging and satisfying. It also provides moments of relative calm during which to deliver narration and dialogue, a combination that lands really well. Of course, the puzzles also result in long breaks between combat encounters, which is what makes the overall gameplay so divisive. For those who are seeking high energy action, and who have only moderate or low interest in the narrative, these gaps are way too long. This game does not provide combat with the depth or frequency of something like For Honor or even previous titles from Ninja Theory (Heavenly Sword, DmC: Devil May Cry). Which is to say, the game doesn’t really target action game fans, but narrative game fans who can stomach some combat and puzzles. But that’s what works so well for me: I really enjoy narrative games, and having brief bursts of action interspersed with calmer puzzle sections with story and worldbuilding makes for an excellently paced experience. It’s just the right variety of tension, adrenaline, contemplation, emotion. When combat encounters begin, I’m excited and ready to fight. Before they wear out their welcome, they come to a close and I have more to explore and discover. When it takes surprising dips into survival-horror elements, the tension grips me. I don’t think this gameplay shifting is for everyone, but it’s incredibly effective for narrative-first games because it provides pacing and framing devices to deliver story. Action can use elements of the narrative (rather than hud prompts to tell you if someone’s behind you, voices will urgently whisper “behind you!” and “watch out!”), as can puzzles (illusions and hidden meanings are manifestations of Senua’s hallucinations and delusions). While pure action games often lose something in their power fantasy and puzzle games often lose something in their lack of danger, the interlocking of many types of gameplay can make the whole experience stronger and more cohesive, making play sessions more surprising and bolstering the narrative they surround. As an aside, it’s also worth noting that Hellblade actually lies to you about permadeath. I think the idea is powerful but I felt that the execution somewhat missed the mark, and ignores realities about busy people’s willingness to make time commitments to games. However, there’s already a lot of discussion around this so I don’t want to go into detail. This is the most intriguing aspect of Hellblade. Representing neurodiversity has always proved challenging; it’s not easy to incorporate accuracy and respect into depictions that still serve the narrative purposes they intend to. Part of Hellblade’s strength in this respect is that it’s unequivocally centered on its character’s psychosis. It’s a story that’s constructed around the character’s mental illness and past traumas. The devs mentioned in the game’s included documentary feature that their intention was not to focus solely on her symptoms, but also on the trauma and isolation inflicted upon her by people around her, a reality faced by those with lived experience. 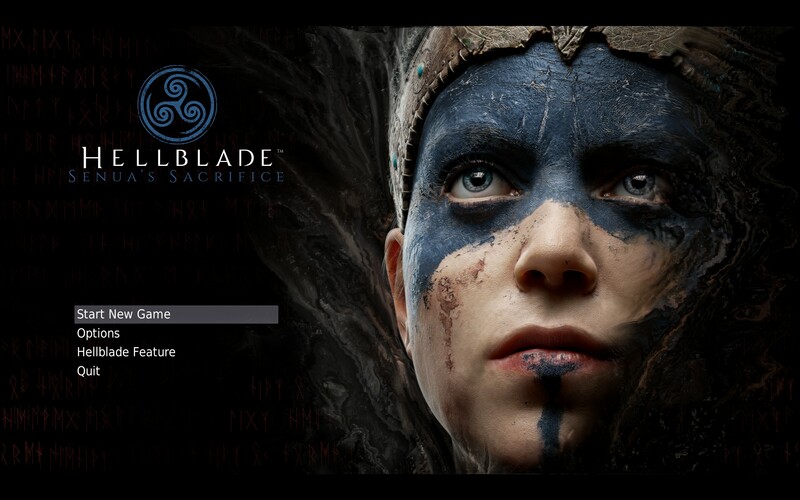 Hellblade’s creators documented much of their research, discussions with mental health professionals, conversations and feedback with neurodivergent people, and philosophies and ideas behind the game’s production. It’s easy to simply say “we talked to experts” and still be guilty of problematic representation. But Ninja Theory earns a lot of good faith with the rigor of their process documentation and the prominence with which they name the experts and collaborators they engaged. I have no expertise with which to analyze their depictions of psychosis, but I’m pleased to see a commitment to conversation with experts and individuals with lived experience, and to see this conversation documented and encouraged. I’ve dug around the internet for critiques of Hellblade’s depictions and haven’t found too much, but it’s clear that Ninja Theory wants to set an example for other developers who are interested in tackling challenging diversity issues. I hope to see further discourse about their approach and the accuracy of their depictions of psychosis, and I’m encouraged by their commitment to positive representation. If you like narrative games and you don’t mind some combat and puzzles, I highly recommend picking up Hellblade: Senua’s Sacrifice. If you’re interested, but it’s not something you’re willing to play, I bet there’s a ton of great let’s plays out there as well (this one seems like it might be good). I’d love to see more conversation about this game’s design and how it tackles sensitive issues. Update: I realize that my take on this may have seemed overly congratulatory of the game’s portrayal of mental illness. I did appreciate the team’s emphasis on accuracy and collecting feedback. But I’m not remotely qualified to speak critically about its depictions, and it’s worth noting that no representation of mental illness is accurate for everyone. Polygon posted an article providing a much more critical take on Hellblade’s depictions of mental health issues from someone with personal experience.